Frequently Asked Questions – Handwriting University: Learn Handwriting Analysis and Graphology. We try to make everything as easy as possible to find and unlock within the site, but if for any reason you cannot find a course or can’t access a product you paid for, hopefully this page will help you. This page is designed to answer any questions you may have without having to contact customer support. Just click on the question you want to see the answer for. How do I locate the Online Courses (Level 100, 101, 201, 301 & 401)? There Is a menu “Online Courses” located to the right of the page. If you have purchased the online versions of these courses, then you will be able to access them directly from this menu. To unlock any of the courses, please see our online catalog page by clicking here. Are there different catalogs for online products and physical products? I’ve ordered an online course and can’t figure out how to access it, what should I do? Before contacting customer or sales support, please read the following, you may be able to unlock the course on your own. Have you checked your email that you purchased the online course with? There should be an email with the subject line “Registration & Confirmation” for the product you ordered. Inside of this email contains instructions on how to activate your online course instantly. Remember, if you want to access a course, you must log-in with your username and password. To verify that you are logged in, your email address is ” yourename@gmail.com “, if nothing is between these quotes, you are not logged in. To log-in, click here. If you cannot find the email that was sent to you and are unable to unlock the course/product you purchased, please contact us using the support page here. We will need to verify your Handwriting University account and the purchase order to unlock the course. I’ve created an account to log-in, but on the Membership Status page, it shows that the free membership is still locked. What can I do to unlock the free membership? The free membership can only be unlocked on the Memberships page, you can find the free general membership by clicking here. How do I attend a live class? 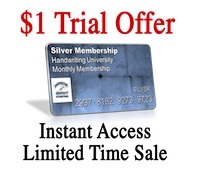 First, a Gold or Silver membership is requested to attend one of our live classes held each month. Note: Silver and Gold members attend the same classes. Second, you need to find out when the live classes are being held. You can do this by clicking here and viewing our Class Schedule. You can also find the schedule by highlighting Members Only, then highlight Special Live Events and select “Class Schedule”. Once you locate the upcoming live class date, whether it’s a tele-class or a tutoring class, you can select which upcoming class you’d like to join by the upcoming date shown. Just for reference, tutoring classes and tele-classes are different. Tutoring classes: Students call in to a group conference call and upload or submit handwriting samples to be analyzed. Our tutoring class host Allie Bradley will lead the class into analyzing the samples and answering any questions that may arise. Tele-classes: These classes always have a certain topic that varies each month. These topics can cover advanced trait stacking, criminal handwriting, Grapho-therapy, how to analyze block printing and much more. I signed up for the Handwriting University Newsletters, does that mean I have a free general membership with Handwriting University? No, unfortunately, we cannot combine the two. The newsletters and Handwriting University Accounts must remain separate. Therefore you have to sign up for both if you want both. You can sign up for the Newsletters by clicking here to receive free audio & video newsletters. You can sign up for the free general membership by clicking here and you can also look at other memberships that unlock new material. What’s the different between the Free, Gold and Silver Membership? The quickest way to see the difference between all three memberships is to look at this chart. I have a Silver/Gold Membership, but in the members only content area, I’m not able to access all the months. What do I need to do? The members only content is unlocked for you each month, starting from the moment you start your paid membership. Example: If you have a paid membership for 4 months, months 1-4 will be unlocked for you. If you purchased your Membership, but did not setup your Handwriting University account on the same day, it’s possible your account could be out of sync with our payment system. Example:You are receiving emails that tell you “New Members Only content has been unlocked for you”, but when you attempt to access them you are denied. This can be fixed, but we must manually fix it, so contact us via our Customer Support Ticket system and we will contact you and fix the situation. How do I cancel my Silver Membership? If you would like to cancel your Silver Membership, simply submit a request form at this page. We will update your account and send you an email confirmation confirming your cancellation. You can also get to this page from the Help Menu. After you cancel, if you ever want to re-subscribe to our Silver Membership, please let us know that you had a Silver Membership in the past so that we can activate your account correctly. I cannot remember my Username or Password for my Handwriting University account. What do I need to do? This is really easy to fix, but you must follow these instructions carefully. Click the link in there to reset your password. Now check your email again, you should have a new email that contains your username and your new generated password. You can change this generated password by logging in and then accessing the “Profile” page located here: Profile Page. Are all health related topics are covered in 301 course? Will trait stacking be covered in-depth in the 301 course? Answer: Yes and No. The idea of combining traits is mentioned in every lecture from the 101-501 courses because no trait lives in a vacuum and cannot simply exist on it’s own with no influence from the person’s emotional outlay and other traits. So, if you listen carefully in the lectures of the 301, trait stacking is mentioned frequently and many examples of traits that “increase” and “decrease” the intensity are mentioned. However, if you want to learn the specific “process” for trait stacking and learn the 50+ primary and advanced traits not covered in the 301 Certification Course, you will want to buy recently revised “501 Advanced Course” which comes out in January of 2012… which includes 8 hours of new video and a 300+ page course workbook not sold in the previous edition. After completing the 301 course, will I be able to handle recruitment with HR? Answer: You will have the basic knowledge needed to utilize the handwriting. However, if you have no prior experience in H.R. you probably will not be qualified to consult at a high level with HR professionals because your knowledge and insight into the problems of Human Resources will not be strong enough. However, if you intern or work side-by-side in an HR department… you can apply the knowledge to hiring within the HR system. Based on my experience with new graduates, HR consultation is one field that requires the highest level of intelligence and some prior knowledge of business or personnel departments to succeed right after graduation. What will be covered in 501 that is not in the 301? Answer: 11 Hours of Advanced Content. In the 2012 version, you will view Bart Baggett on stage in Bangalore India presenting a new Advanced Seminar with over 40 new primary traits, health in handwriting, verbal analysis, and an exact system for stacking and evaluating all the basic and advanced traits together. Plus, the latest version includes a 200+ page course workbook which you must answer questions and turn in for grading. Now, you can get “certified” as a Advanced Level Handwriting Analyst upon graduating the 501 course. Just review the 501 course page or call our office for clarifications. How much is this certificate recognized in India as well as other countries? 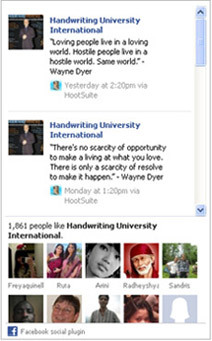 Answer: Handwriting University is one of the most respected educational institutions worldwide. To our knowledge, there is not an accredited school solely dedicated to graphology… so you should look for reputation and satisfied students – not government licenses.